Environmentally responsible. Unmatched performance. Real Value. The new eco Solus HM is the first in a family of passenger and light truck tires that are formulated to be less impactful on the environment, while delivering exceptional performance. Through its unique formulation and compounding, the eco Solus HM delivers superior handling and ride comfort with a 100,000 mile treadwear warranty. The result is one of the lowest costs per mile in the tire industry today. High angle lateral grooves and multi-depth sipes increase biting edges for increased wet and snow traction. Groove and sipe placement are carefully crafted to retain tread block rigidity for longer wear. Kumho™s ETOPS and ESCOT technologies ensure precise calculation of the optimum casing shape and profile to deliver a perfect combination of ride comfort and handling. Kumho™s proprietary noise simulation know-how delivers exceptionally low-noise operation. ormulated with rubber compounds that are free of High Aromatic Oils, the eco Solus HM greatly reduces harmful effects on the environment. Less rolling resistance also delivers improved fuel economy, thus less strain on non-renewable resources. 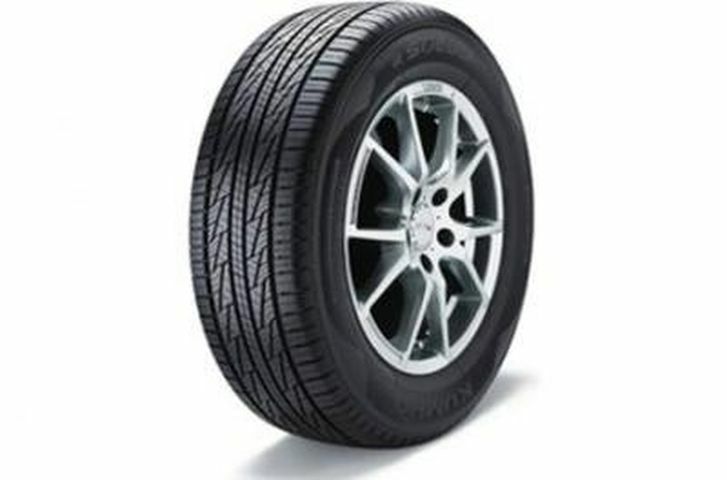 P205/65R-16 800AB 1,477 lbs 44 psi 12/32nds 5.5-7.5" 9" N/A 26"
Purchase includes the Kumho Eco Solus HM KR22 tire only. The wheel rim shown in the picture is not included. Picture provided is a stock picture from the manufacturer and may or may not reflect the actual product being ordered. All Kumho Eco Solus HM KR22 tires are continuously developing with manufactured improvements. With that said, Simple Tire and the manufacturers have the right to change these tire specifications at any time without notice or obligation. Please Note: Specifications of the Kumho Eco Solus HM KR22 tires shown above are listed to be as accurate as possible based on the information provided to us by Kumho tires. This product is covered by a 100,000 mile manufacturer’s treadlife warranty.